What do you think is the best Wordpress add on for social media sharing? Social sharing is an important part of blogging if you want your message to go wide. There are loads of tools available that will do this and I have done very little research on this topic. A tweet from my Empire Ave friend Ben Hanten today got me thinking about this. Whenever I set up a new blog, I look at what’s available. For example, this one is from my Luigi Cappel blog. It’s deliberately small so you have to go visit one of my latest posts to see it better. So I got to thinking about what we want from these tools. Fundamentally we want them to be easy to use and relatively intelligent, for example if we want to tweet about the blog, we want the tweet to be include the headline as well as the link. It would be cool if you could highlight some text and it incorporates the selected text. But now I’m getting into the features of the linking tools rather than the bundle in a plug in app. The ability to control the order of the social media offered. One that is regularly updated with new social media apps that come up. The ability to pick which individual linking tools to use, effectively make your own plug in without having the knowledge to code it. An analytic suite that allows you to do historical search on what information was shared with which social media and how often. Most of these features would come at a cost, but I would be happy to pay a small sum to be able to use a tool with these features. So the question for you is, what do you use/like and why? What would you recommend for a WordPress blog for someone like me who doesn’t do code? Does what I’m asking for already exist? TomTom has just produced an update on their report on how long motorists spend stuck in traffic jams in Australia and New Zealand. When I first looked at the numbers I thought about commute time, but this is really about the time when you are pretty much not moving at all. Suddenly 94 hours a year sounds like a lot. That’s a lot of lost productivity! It probably won’t surprise you to see Sydney at the top of the list, but probably the most significant statistic in this report is the 16% increase in congestion in Auckland, New Zealand. This won’t be surprising to people who commute in Auckland given the continued growth in population. How long are you prepared to sit in traffic and what will you do to avoid it? Many people tell me they have no choice but to sit in the traffic, other than starting early or finishing late. I don’t agree and I’d say neither does TomTom, otherwise they wouldn’t have real time traffic on their car navigation GPS devices. This is one of the major reasons why I recommend TomTom as the best GPS to buy for New Zealand, having tried most brands at some stage. So what can you do if you are in New Zealand? There are loads of websites you can visit, but if you are driving, in my book a TomTom device is the best option, because traffic is fluid. The conditions can change significantly between the time you pick up your keys and the time you start driving. They will very likely change even during your trip. Buy a TomTom with Real Time Traffic. Many people say they have no choice, for example when they live on the North Shore. Wrong, I’ve gone the long distance into Auckland via SH18 and had a clean drive all the way through. Check out AA Roadwatch before you go. Check out the Auckland Traffic Webcams. Check out the NZTA Traffic Conditions site. have you seen the new Auckland Traffic current speed page? AA Journey Times is a great resource. Use a traffic app like Waze. I haven’t used it for a while and am have just reinstalled it on my mobile to see if it has improved. Last time I tried it, it was reporting a red light as an incident and the reports from the public were about where about where there were police with radars. I don’t speed, so I don’t care. Also the roads weren’t up to date in my area. Just checked and they still aren’t. The app looks smarter, but looking good doesn’t get me where I want to go in a hurry. Google also has real time traffic, if you set up a route and provides you with alternative routes. How good is it? I’d love to see some tests. The big difference to me is that TomTom uses a combination of all of their users as well as commercially tracked vehicles. Google tracks mobile devices. I doubt that it can tell the difference between 15 people in a bus, or 3 people in a car. It’s way better than nothing, but what is your time worth? Telecommute. This one is really interesting because many people don’t need to be in their office all day, every day. One of the barriers is a companies not trusting that their staff will work from home, or will get distracted and do non work related things. Of course people could do those in the time they would have spent in the car so it would be a win win. I’ll discuss this in a future blog, because it is worth exploring how to make this work successfully. Some days have worse traffic than others. What is 94 hours of your time worth? Let’s put it in perspective. How much do you earn an hour? How many things didn’t you do because you didn’t have time? Ever missed your child’s school performance or sport? How do you recover that? Ever arrived late or not at all for an important meeting. Ever been late for work? The really cool thing is that if you have a device like a TomTom with Live Traffic, you can contribute to the information yourself, so the more people using it the better the quality of the information. You can download a FREE copy of my eBook Buying a House - Using Real Estate Apps, Maps and Location Based Services right now and for about another 8 hours. I did it as a Halloween promotion, but its in the Amazon US time zone. For more info about the book, check out this blog. Who can you trust? Who do you trust? Who do you trust? Who can you trust? 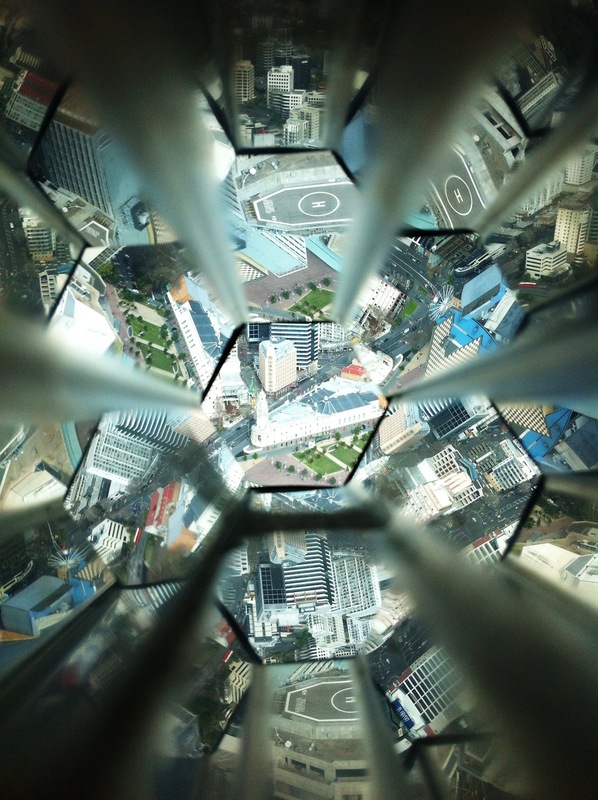 With happenings in Auckland, New Zealand mayoral politics recently, the NSA spying, and other revelations, we find ourselves in interesting times. With the invasive growth of social media we live in a world of increasing transparency. Corporates and Governments which have thrived on sharing only what they think people need to know are losing that battle. I’ve been reading article in The Futurist by Rolf Jensen, Chief Imagination Officer (I like that title!) of Dream Company in Denmark who compares today’s society to the first Renaissance. Gutenberg’s Press accelerated the spread of new ideas, and the golden age sprung out of the middle ages where much of the world was controlled by a religious hierarchy. We have a similar break-up to political hierarchy’s now, particularly in but not limited to the Middle East and Europe, and like the Gutenberg Press, Social Media is now making important information available to the masses, most significantly in real time. This means that it isn’t possible for governments and corporations to use smoke and mirrors quite so much. With trending information, we can see right past the kaleidoscopic obfuscation to what is really going on. From Pew Research: In the 1960′s 75% of the US public trusted their Government. In 2010 the result was 25%! The European barometer polled UK voters in 2005 and found a trust level of only 34%. In 2012 that was down to 21%. Gallop says that teachers are trusted by 84%. That’s great news isn’t it. What a shame they get one of the smallest parts of the budget! Back to social media though, what we are doing is finding groups of people that we do trust and building a new society. We’re sharing knowledge and information in countless ways that have immediacy. As an example, in my new eBook, Buying a House – Using Real Estate Apps, Maps and Location Based Services, I speak a lot about using social media to research where to live. I cover questions like where to find people who are like you, or people who can tell you about a suburb or area, who have nothing to gain by sharing that information. Who can you trust to give you honest information? I feel very grateful to live in such exciting times where the power is gong back to the people. Of course ‘the people’ do have to take the power and whilst everyone subsequently had an opinion on Mayor Len Brown’s indiscretions, only 33% turned up to vote in the Auckland local Government elections. I do like the saying ‘You get the Government you deserve’. So who do you trust? Who do you go to for advice? How are you going to use the information now available to you, to help build the world you want for yourself and your children? How will you contribute? We all know buying a house is stressful. Get it right and you can own your dream home, get it wrong and the dream could be a nightmare. It’s all about Location as Luigi Cappel explains in his new Kindle eBook ‘Buying a House – Using Real Estate Apps, Maps and Location Based Services’, new on the Amazon Kindle store today. This unique book takes you into the world of mobile applications that take advantage of mobile and tablet functionality such as GPS and the camera, web sites and map tools that can help you do your essential research before you start looking at homes. Illustrations show examples and there are many links to apps and web sites from around the world. We chose Kindle as a platform because it is universal. You don’t have to own a Kindle device, you can get free software for your PC, smartphone or tablet. Real Estate Agents. Should you do your homework first? How do you find a good one? 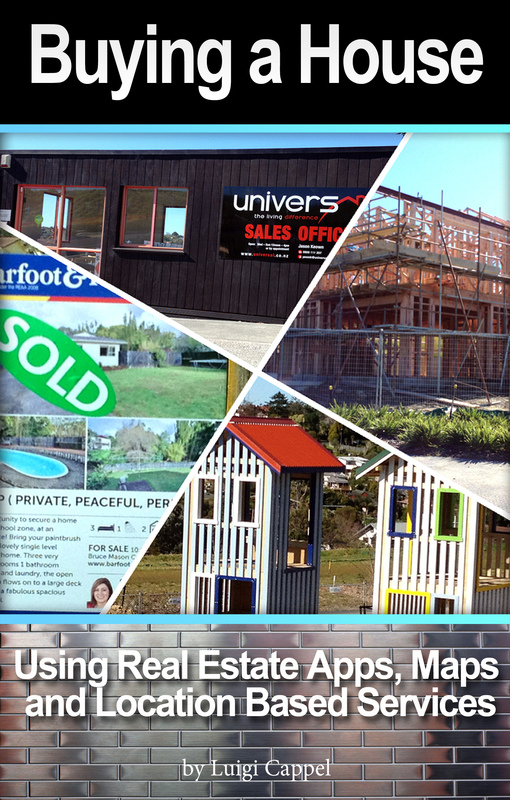 How do you find a good real estate agency? Why does it matter? Social Media. How can you use social media to find out about areas you might want to live in, even if you don’t know anyone who lives there? How to use tools like Facebook Graph Search and others. Scoping the Neighborhood. What’s the street like? What are the demographics, are the people there like me? What about neighborhood crime? You don’t have to drive 120km like I did once, to find the neighbors had rusting car bodies and other mess all over the back yard. Utilities. Can you take it for granted that you’ll get good TV coverage, gas, cellular mobile or fast broadband? How can you find out? Commuting. How long will it take to get to and from work at rush hour? What are the transport options such as buses, trains or ferries? Viewing houses without having to buy a gas station. Optimizing your day visiting properties. What tools make that easy and how do you use them. The property and risks. How do you identify risks like floods or slips? Does it get all day sun? What amenities are in walking distance? What do you need? Schools, shops, health services? How can you check for things like that before you go? Check List Applications. You can’t possibly remember what belonged with what house once you’ve seen a pile of them. What should you even be looking for? Real Estate Applications. There are hundreds of them. What should you look for? Should you use one that is unique to a real estate brand, like Barfoot & Thompson or something more generic like Trulia? What sort of features should you look for? But wait there is more. This is a valuable book for anyone who is contemplating buying a house. As an eBook you can easily click on any section and go straight there and of course with Kindle you can add your own comments and bookmarks. If you know anyone who is thinking of buying a house, let them know about this book, it is an investment that they will benefit from. It’s an easy read, packed with lots of useful information and very little jargon. Check it out here and feel free to leave comments. If you buy it, I would welcome a review on the Amazon site. 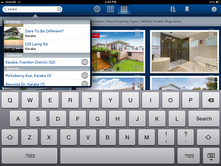 Have You Tried The New Barfoot and Thompson iPad Real Estate App? finalist in the Designers Institute Best Design Awards 2013 and I’m sure it will do well. Here’s my review. perhaps how your property value may be faring. scroll through photos and information. I’ll come back to that. I was surprised that they haven’t done an iPhone app, nor an Android app, but they do have a website optimised for mobile. than a mobile specific one, but that’s just my opinion. on an iPad as well. information that could influence their next step. location of the school you select. As I said, hidden gems. 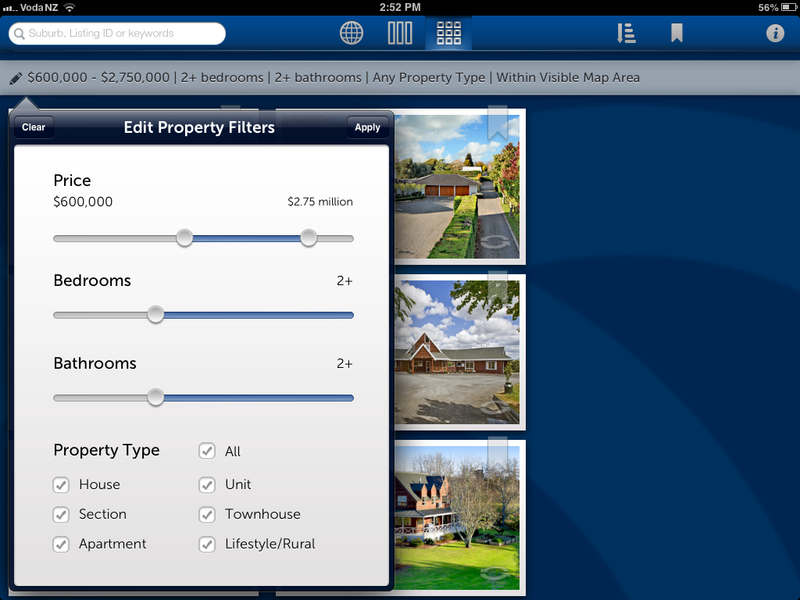 The Property Filter feature is elegant, I really like it. It is smooth and intuitive. Save or Apply and go explore. friendliness aren’t always the same thing. and more. There were photos, floor plans and even Google Street View. into your calendar, so you won’t forget. also important and easy to get from the Google API’s. right now, or when you are planning to go and look at the property. I don’t expect demographics, at least before the 2013 Census is out. people in the area and find out if they are like you? of direction. A route planner would be very cool and that would be an award winning feature imho. app on the block, but his review is just about them. the saved criteria of price, bedrooms etc that you are looking for. In the meantime, if you have an iPad, try the app out and leave a comment on this blog to tell me what you think of it. What will you do if the big earthquake hits? Are there location based apps that can help and what lessons can we learn from previous earthquakes such as the ones that devastated buildings and people in Christchurch? The answer is a resounding yes and perhaps not the ones, or in the way you might have thought. GNS Science calls them the Cook Strait earthquakes and aftershocks, but most people have their eyes on Wellington. As at the time I am writing this post there have been almost 2,000 quakes and aftershocks in the last 12 days. So what are some of the problems you might face and apps you might be able to use? Where are my staff or colleagues? How do I get to my key people? Foursquare. A lot of people don't get the point of Foursquare and most people don't think laterally. Foursquare uses the GPS on your mobile to allow you to check into places. If you do nothing else, set up your family, close friends and colleagues on Foursquare and during times like these, get them to check into the places they are going to. Even if you can't contact them, you will know the last place they checked into. You can also add comments and photos and link to other applications, for example you can automatically tweet your location and photos and any tips. Tips saying that a shop or petrol station is open would be helpful as would information about gridlock. Facebook. The mobile Facebook allows you to check in as well. It doesn't appear to have the same number of locations in its database as yet, as Foursquare does, but you can check in. Chances are you already have all your friends and family set up if you are a Facebook user. Twitter. Twitter allows you to check in as well. One of the things that Twitter does well is use of hashtags. #eqnz and #wellington are good examples and you can save searches of hashtags in order to get the latest news. One thing Twitter does well on PC, but not on mobile apps is Lists. On a PC you can create lists of people who you can follow, so for example you can create lists just for the people you want to stay in touch with. Hootsuite. As above. The good thing with Hootsuite, which allows you to do the same things as Twitter, is that you can set up multiple streams in columns, so for example you can have live streams for specific 'searches'. Note you could also create a unique hashtag that you agree to use between contacts. All you need to do to create a hashtag is pick a word and put the # or pound symbol in front of it and its a go. Hootsuite isn't the only application of its type but it is one of the big ones and has recently acquired one of its major competitors Seesmic, which is likely to be merged into it soon. Hootsuite also allows you to post to other social media including Facebook and LinkedIn. Google+ is another one which is growing rapidly and of course with the search capabilities of Google, would be a wise app to include. Personally I like the app better than using it on my web browser. AA Roadwatch aka AA Traffic. Not actually an app, you need to access it on your web browser, but it is the best service in New Zealand for real time traffic information. If you live in other parts of the world I'd recommend Google, but in New Zealand AA Maps is the best imho. You can also subscribe to SMS area or route alerts on your mobile and the site also includes airport and Cook Strait Ferry information. Unfortunately not for Wellington Airport. TomTom Car Navigation. 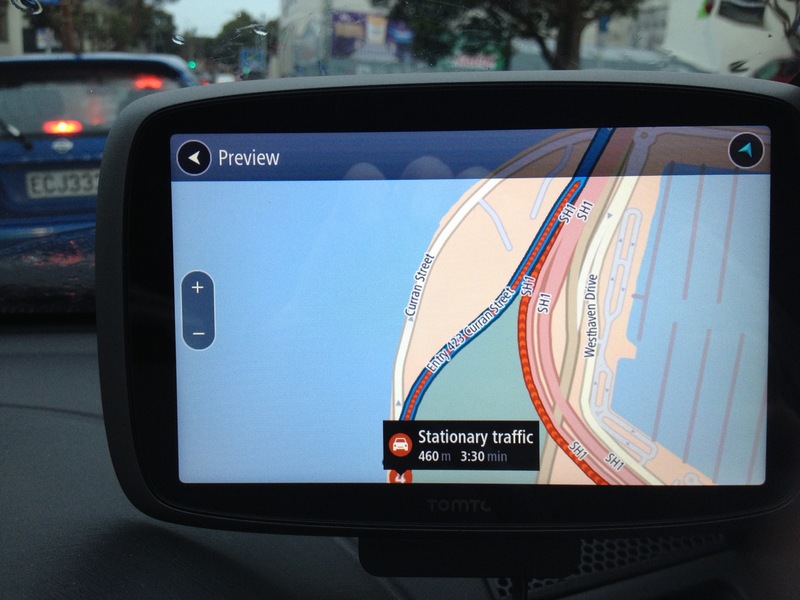 TomTom is my GPS car navigation product of choice when it comes to car navigation and real time traffic conditions. You can have it as an application on your mobile smartphone or you can purchase a GO Series device. I haven't got the latest model, but I have used these in New Zealand, Australia and in the USA and the combination of real time traffic and the latest maps takes a huge amount of stress out of the situation. It will not just give you the best route, but it will route you around traffic jams and road closures. I had friends in Christchurch during the last quake who took desperate hours to drive a few kilometers to locate family members and get them home. TomTom used to have a Buddy Finder feature as well, so that you could share your location with other people using a Go Live devoice. I think they stopped that and I haven't tried their latest products, so I don't know if they still have it. They also supported 3rd party apps on the nav device like Foursquare, but again I'm not sure if that is on the current devices. Your newspaper apps. I have NZ Herald, Stuff, ABC News, and NBC on my iPad. I do have to warn you that many newspapers are light staffed during the night, perhaps still a historic legacy of their print origins and cost cutting, but they are still worth having. In an emergency I tend to rely on social media, which you might notice is where the newspapers today get a lot of their their latest 'on the spot' images and news from. After all if there is gridlock, they can't get there either. Vine and Instagram are worth having, particularly if you want to share still or video images with family or friends. They also allow location based searching and hashtags. The Metservice app includes traffic cameras, so you can see what is going on key highways and check out the weather at the same time. Emergency Check Lists. There are loads of apps available that allow you to compile lists. You shouldn't need any help with that. Your phone book has lists of things you should have in your emergency kit, whether that is what to have at home or what to keep in your car. If you are in a risk area like Wellington and Marlborough right now, hopefully you have the fully sorted. You could just use the notepad on your device, but there are some great list apps like Wunderlist and Evernote is a great free tool for keeping information together that I recommend to everyone. You can do all sorts of amazing things with it including copying this whole page. It will synchronise your information across every device you have it installed on. Civil Defence Apps. I have the Auckland Civil Defence App. I have registered and have notifications enabled. This is important because if there is an emergency, say a tsunami for example, they can't establish Welfare Centres and other beachheads until they know which areas are safe. I did find it interesting that Wellington doesn't appear to have an app. NZ Quakes App. 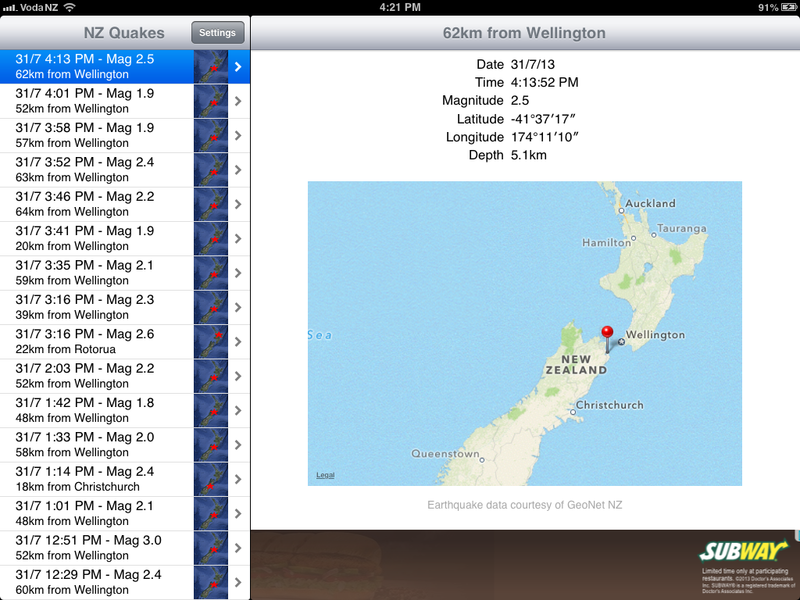 I have the NZ Quakes apps on my iPad and iPhone. It can be morbidly fascinating and as you can see from the image, it has been relentless. If you're in the zone, you may not need to know that there has been yet another quake, but it can let you know the location and intensity. It could of course just add to the stress. Me, I like facts. Accommodation Sites. Take your pic for what is available in your area or country. This may seem strange, but if you find yourself suddenly in need of accommodation, it would be handy to have an application that can tell you where there is local accommodation. There aren't any apps that I'm aware of designed for emergencies and this might be an opportunity for developers to give this some thought. The issue is that if properties don't have power or communications, it is not going to be easy for them to advise reservation engines if they have rooms available. Vehicle Tracking. A lot of people invest in low cost vehicle tracking solutions in order to track their company vehicles and claim back road user charges. But this same technology is often used by people who have sports or classic vehicles, vehicles they don't want to lose. It can also be used to keep track of the kids when they are borrowing your car. These systems, such as the GPS Log Book Live are available for only $399 and $20 per month for live tracking. This could be the perfect solution if you want to know where your people are. If this is of interest, let me know because I am trying to negotiate a deal for my readers. Glympse is a great application for people who need to let their friends and family know where they and where they are going. It can track you in real time and let those who need to know where you are find you. Where's My iPhone. I have this on my iPhone and iPad. It is a standard feature and allows me to see where my devices are on a map from another device or PC and even make a noise, or blank them out. To do this, the person you entrust must have your Apple ID and password. There are similar applications for other mobile operating systems. Flashlight. If you find yourself in a critical situation in the dark and you didn't have a torch in your emergency kit (do it now), the application called Flashlight can turn your mobile display into a torch. Do keep in mind that this will have a major impact on your battery life, but useful nevertheless. I could go on, but this should give you a head start in your preparation for an emergency situation. If the big earthquake hits your town, if you are racing away from an impending tsunami, or a new volcano decides to appear on your doorstep. If you live in a country like New Zealand which is perched on the ring of fire, it is highly likely that you will experience an earthquake. The more prepared you are the better and the device you are most likely to always have on you is your mobile. Do you have a favourite app that I haven't mentioned? Please share you comments on this blog so we can all learn fro each other. New aftermarket GPS car nav units have been blamed for a spate of car accidents due to inaccurate map data. The wave of new aftermarket HUD (Heads Up Display) car navigation devices over the last few years were met with much enthusiasm. Being able to purchase devices like the Garmin HUD (How did they manage to get that as a brand name?) that launched in 2013 for under $200 bundled with a nav unit or $150 on its own, made it the next car enthusiasts must have device (toy). Kids are enjoying an epic Experience combining Augmented Reality, Location Based Services and more with a colouring competition and action packed diorama at Westfield St Lukes Mall in Auckland and location based AR treasure hunts in most other Westfield Malls around New Zealand. Imersia has been working on a number of projects combining these technologies over the last year. This one is the most public and we are really excited to have found people at 20th Century Fox who shared our vision and helped us make it a reality for the July School Holidays. The first campaign is an AR treasure hunt. Children pick up a form and instructions at their local Westfield Mall, download an iOS or Android app and then head off to find the first billboard clue. They point their smartphone or tablet's camera at the billboard and a movie character and audio clip from the epic movie magically appear in front of their eyes in a WOW moment. This isn't an experience created in the USA or Europe, this was conceived by Neil at 20th Century Fox New Zealand. He asked Rob at Boston Digital if he knew of anyone who could bring this to life for him and Rob put him on to me. The treasure hunt combines GPS on the mobile with the camera in smartphones to provide the experience and analytics in the background provide the client with information on the locations where the apps were downloaded, when and where they were played and other key information, providing ROI information. The colouring competition at St Lukes is the piece de resistance and very cool. The children go to a table and create a colouring masterpiece and then take it to the entrance of the epic experience where they are dressed as leafmen and get guided through an experience ending at the home of Nim. There they point their picture at a camera and magically 3D video images appear right out of their own artwork. The look on their faces as they leave the experience is priceless and many of them go straight back to the beginning to go again! To find out more about this experience and see pictures, visit our blog. We had Steve Simms and the team from TV3 Firstline over to check it out on Saturday and this aired on the program this morning. They thought it was great! Imersia is working on several projects that we can't really talk about yet and talking to brands and agencies around the country and offshore. Location Based Gamification and Augmented Reality are powerful tools to engage clients and consumers and as I mentioned before, this is a Kiwi company, supporting Kiwi developers. We have a global architecture and can support gamified applications anywhere on the planet, many without requiring any local infrastructure. For example, you can play our Finga Footy AR game on the Eiffel Tower or at Centraal Station in Amsterdam just as easily as at Aotea Square in Auckland. Just as I posted this, the link went up on TV 3 for the story they aired this morning. You can check it out here.